TPC Overall Rank: #224 out of 2933 rides. In User Top 10: 27 times. User Tracker Count: 99 times. Not the tallest or fastest, and quite a headbanger throughout the ride. Also, there's a line before the let people through where a ride operator uses a metal detector want to stop riders from bringing on loose objects. While I kind of understand their desire to keep people from dropping things onto other guests below, it slows down the line so much to the point where only half the train is full because the two trains load faster than people are let through the gate. However, the views are nice with the beach, boardwalk, and various other rides in the area, and the restraints are some of the more comfortable ones out there. Worth riding for the views and experience, but not something I'd go back for. Much improved fthanks to the new seats that were recently installed. I remember HATING this some years ago, but I rode it again recently and found it much smoother and a lot less rough on the head. I just don't believe Vekoma SLC's are good coasters. They're cool and they seem exciting, but the headbanging and overall roughness of the track simply kill the ride. What I really like about it is just how intense it can be! Until after the two barrel rolls, the pace is relentless and the whole thing has TONS of G-forces to offer. It is forceful and impressively fast. Plus this clone in particular has an advantage that makes it pop: the landscaping. There's no theming, but it just does look awesome with the beach and sea in background. But if you thought some of the elements looked cool and exciting, like the twisted hill after the 2 first inversions, well don't set your bars too high. The fact that your head bangs itself all the time and that the track is so simplisticly and disgraciously shaped makes for a real disappointment! It doesn't feel exciting, or engaging, or stylish, it only feels intense. One funny souvenir I have regarding my ride is that when I asked my dad how he found the ride, he didn't reply something like 'that was awesome', or 'OMG that was fast', or 'That was so darn cool!!'. It was a fine coaster, but the roughness and the so-so shaping of the track changed his mind. He just said it was 'an experience', because he didn't find it felt like a coaster. This coaster is a knot of pinkish/redish metal interwining around slides, paths, a log flume, and flats. With the supports, track, and coaster all being the same color this coaster looks like someones intesine and its actually looks quite terrifying. The view of the ocean from the top of the first drop is wonderful. And quite terrifying. The compact seats just dont feel all so safe for some reason, and I actually like that. The first drop is intense and after that its hard to tell if your upside down or right side up. This baby packs the punch (literally). Its like one thing after another with foot choppers at every element. I swear right before the final two twist nor easter flips over another section of track and comes so close to de-legging from that damn log flume. Soon after a pole is in front of your face before you roll over again. It felt like they were trying to kill me. Loved it actually. Im giving this coaster an extra point for its unique location. And the fact that boardwalks just dont offer thrills like this. Usually its on the level of some local carnival! I liked how the ride intertwines with the rest of the nearby rides on this pier. Otherwise, this ride is a pretty standard hang and bang like the Mind Eraser coasters at 6 Flags. 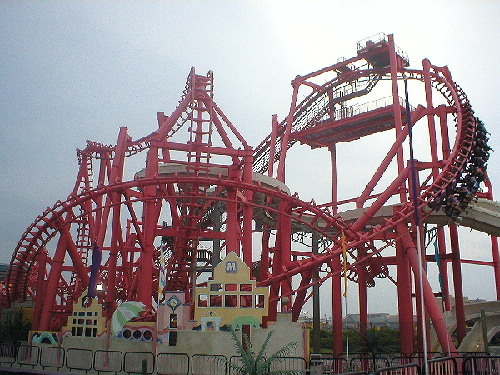 A decent inverted coaster, not quite on par with Batman at SFGAdv. I agree with other reviews here that they did as good a job as can be expected with such a small area to work with. To some extent, this ride is probably overhyped because its the best ride on the boardwalk (which really isnt saying much). Still, if youve got $5 in your pocket and youre hell-bent on going on a ride, this is probably your best option. Didnt keep my head back. Gave me a slight headache. Short, intense, nuts!